Tired of bickering, jealousy, and selfishness? Kids are naturally materialistic and self-serving- but the good news is that gratitude can be taught. And from gratitude flows joy. 1 Surprise them! Avoid too many choices: Surprises help children see something as a gift, not an entitlement. Having too many choices breeds unhappiness- you are always wondering if you could have something better. One night, we tried to have a conversation with our children about where we might go for our summer vacation. Within five minutes, Disney World was not good enough. Everyone had a better idea, and no one was going to be happy with whatever we came up with. I put a prompt end to that conversation, and about a week later, I announced that I had a big surprise- we were going to Mt. Rushmore! I showed off my plans for our national park camping vacation, and they couldn’t have been more excited. Our low-budget road trip turned out to be a fabulous success. �--� For older children, try keeping a gratitude journal. Gratitude journals have been shown to be an effective approach to helping children be happier: One study had 221 sixth- and seventh-graders write down five things they were grateful for every day for two weeks. Three weeks later, these students had a better outlook on school and greater life satisfaction compared with kids assigned to list five hassles. 3 Teach your children their past: What are your family stories of hardship and perseverance? My husband’s great-grandmother ironed for a living- her iron is now a bookend in our house, reminding our children what hard work really means. As a child, my grandmother washed dishes for ten cents per week during the depression. We keep her picture in our study, and tell our children her story. Not sure of your past? Just take a family trip to the history museum, a battlefield, or other historic site. You will return home grateful. 4 Help your children serve someone who does not “need” charity: It’s great for kids to participate in scout food collections and other community charity programs, but these events only occur a few times per year and you rarely meet the people you are serving. Find someone in your everyday life for your children to serve regularly, even if this person doesn’t really need charity. We have a neighbor who lives alone and appreciates our left-overs so she doesn’t have to cook for one person. Our kids love to bring her food. One night they were all griping about how they didn’t like the dinner I made, until I asked them to bring a plate to our neighbor. Suddenly all the complaining stopped and they were out the door with her food, eager to have the opportunity to serve her. 6 Say “Thank you:” Teach young children to say “thank you” as part of a full sentence, for example, “Thank you, Daddy, for making dinner.” Encourage school-aged kids to say thank you throughout the day, especially when you help them get ready for school or drive them to activities. Have them thank coaches for practice and music teachers for lessons. 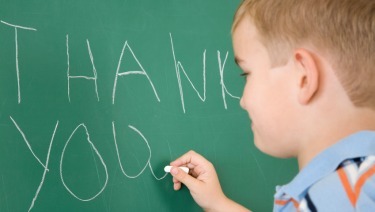 7 Lead by example: How many times per day do you say “thank you”? Have you told your children what you are thankful for today? Our children are watching our every waking move. We can’t ask them to be grateful if we are not. Come home and talk about the happy parts of your day, making a conscious choice not to complain. See Offering Boundaries & Being Role Models (Video). 8 Teach “‘Tis better to give than to receive.” Even toddlers can buy or make gifts for others: Take young children holiday shopping at the dollar store. Challenge them to pick out gifts for others without buying something for themselves. It’s hard! See How to Inspire Generosity in Children. 9 Make time for chores: Most children have about four hours between the time they get home from school and bedtime. During those four hours, they have to accomplish homework, extracurricular activities, dinner, bath, and bedtime. It’s hard to find time for chores. Without chores, children just can’t understand what it takes to run a household- they will take clean laundry and dishes for granted. Find age-appropriate chores for your children, even just 5-10 minutes per day. Consider leaving time-intensive chores for the weekend, such as yard work, bathroom cleaning, and linen changing. 10 Let big kids take care of little kids: They say you can’t really understand what it takes to raise a child until you have your own children. Perhaps, but giving big kids responsibilities for little kids will start to help them have an attitude of gratitude towards their parents. Pair up big kids with little kids to get chores done or get through homework. �--� School aged children can read books to toddlers or help them get dressed. Your older children will gain self-confidence and a sense of responsibility, and the relationship they build with their younger siblings will last a lifetime. 11 Give experiential gifts, not stuff: Too many toys? How about gifting a membership to the children’s museum, a soccer registration fee, or a camping trip? Experiential gifts build relationships, not materialism. 12 Monitor your children’s media: Our children are bombarded with age-targeted marketing that they are too young to resist or understand. Media fuels materialism. It is our job to carefully monitor their media so that they aren’t dragged into marketing and made to feel incomplete or unfulfilled.